According to a clinical study published in the Atherosclerosis journal, if people add just one food in their everyday diet, they will reduce the risk of heart disease, restore health, and reverse illness if they have a heart disease. The researchers have proved that pomegranate extract might reverse and even prevent the primary pathology related to heart disease, such as the gradual thickening of coronary arteries as a result of build-up of fatty materials. And this is not the only study which proved this. There was a three-year clinical trial, published in Clinical Nutrition in 2004, according to which the intake of pomegranate juice on a daily basis has actually succeeded to reverse artery stenosis by about 29 percent in a one year period. The cholesterol-lowering statins were connected to many unfavorable health effects. The ongoing research of the incredible pomegranate benefits might actually point to pomegranate juice as a natural alternative method to unclog arteries and avoid heart illness. These healing properties of pomegranate derive from a long list of its health benefits which were repeatedly confirmed. There are many pomegranate’s health benefits which aren’t as popular as those of other fruits and vegetables. We present you couple of more health benefits from this fruit, in case you doubt whether to include them in your daily diet. Just one cup of pomegranate seeds includes 7 grams of fiber, 144 calories, 3 grams of protein, potassium, folate, and vitamin C and K. Moreover, they contain significant amount of antioxidants which help in the prevention of cell damage occurring as a result of oxidation. The two compounds most responsible for the healthy attributes of pomegranate are Punicalagins, highly potent antioxidants located in the peel and juice of a pomegranate, and punicic acid which is the primary fatty acid in the seeds of pomegranates. 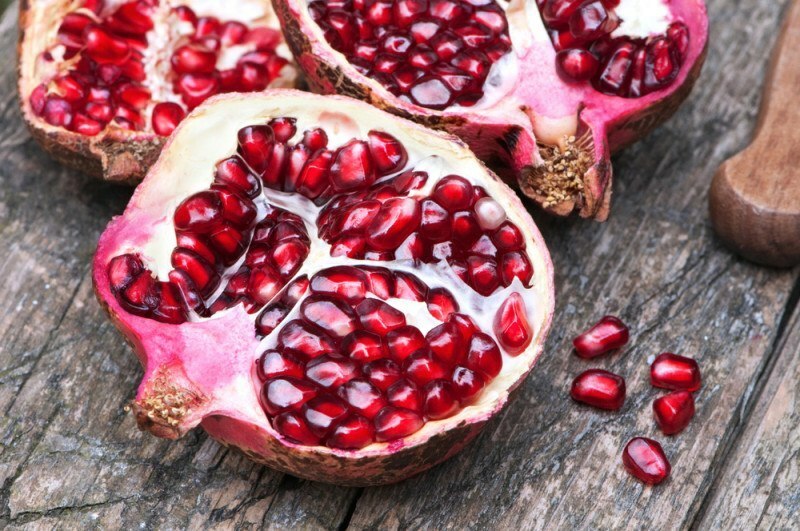 Since pomegranates have anti-inflammatory attributes, they are perfect for lowering inflammation, helping to avoid type 2 diabetes, cancer, heart disease, obesity and Alzheimer’s disease. According to one study, people with high blood pressure have drastically lowered their blood pressure in a period of 2 weeks, with a daily consumption of 150 ml of pomegranate juice. Similar results were obtained by other studies too, showing that the juice from this fruit can reduce blood pressure, as well as the risk of stroke and a heart attack. Pomegranates have potent medicinal attributes which help fight dangerous bacteria in our body, due to the plant compounds in their content. They were proved to act beneficially against some types of bacteria and fungal infections. Read The Labels On Plastic Bottles! Otherwise, You Can Get Poisoned Or Even Cancer!